Energy efficient dishwashers can wash your dishes using less water and energy than if you were to wash them by hand. That’s what the ENERGY STAR folks tell us. But is it really true? I used to be doubtful. I can wash the supper dishes by hand using barely a gallon of water, while energy efficient dishwashers use around 4 gallons of water for a full load, plus all that electricity to heat the water and slosh it around. In this article I will share my techniques for doing dishes by hand with as little water and energy as possible. But I will mainly focus on energy efficient dishwashers, because I have finally reached the conclusion that for most people, energy efficient dishwashers are a better choice than hand-washing, as long as you use the dishwasher appropriately. If you watch a typical North American wash dishes by hand, it’s not hard to see why energy efficient dishwashers beat hand washing just about every time. Some people leave the tap running continuously as they wash; some fill a sink with hot water and then run cold water in the second sink to rinse; some are constantly squeezing dish soap into a sponge. When you add up all the energy that went into warming the water, making the soap, and even the energy for purifying and pumping the water to your house, it can add up to a lot more than you think. 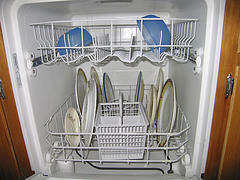 Don’t pre-rinse dishes before washing, if you have a newer, energy efficient dishwasher. Just scrape leftover food off without using any water. The dishwasher should be able to handle small bits of food residue. Don’t forget that your municipal water department (or your own well pump) uses energy to treat and pump the water to your house. If the dishwasher is up to the task, don’t waste your own effort and water on pre-rinsing. Lower your hot water tank temperature. Modern energy efficient dishwashers have a heating element that heats the water to 140F. This means you can lower your water heater temperature to 120F, saving a lot of energy on hot water (since much of the heat leaks out through the tank walls) and reducing the risk of scalding from tap-water. Don’t use too much soap. Especially if your water is soft, you don’t need much dishwasher detergent. Remember that dishwasher detergents are partly manufactured from fossil fuels, so saving detergent means saving energy and CO2 emissions. My parents’ water comes from a lake, which is quite soft (acidic); they use only a teaspoon of biodegradable dishwasher detergent for each of the two wash cycles. Avoid heated drying. Do not use the heated dry feature. This uses electrical energy to heat the heating element after the wash cycle is complete, and can use a lot of electricity. 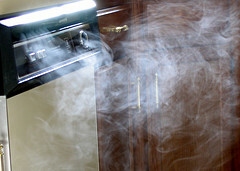 It also warms your house, which in warm weather can mean additional work for your air conditioner or for cooling fans. Instead, either use the fan-dry feature, or just open the dishwasher, turn dishes with water pooled on their bottoms right side up to let the water drain, and let them air dry. Use as light a wash as possible. If you do pre-rinse your dishes – and there are times when this makes sense, as explained below – use the light wash setting. You’ll save an entire wash cycle, with all the hot water that entails. Only run your dishwasher when full. It’s better to wash a few forks or plates by hand, if you’re running short, and wait for the dishwasher to be full after the next meal, than to run it before it’s full. Just do the hand washing efficiently. If you find yourself frequently running the dishwasher because you’ve run out of dishes, maybe it’s time to buy a few more place settings. Remember that some energy efficient dishwashers have built in sensors for both food residue (so-called soil detectors) and water level; such a dishwasher may be able to detect when you are running a small load, and use less energy than it otherwise would. But whenever possible, try to wash only full loads as you’ll use less energy for each dish washed. Use the delayed start feature to run the dishwasher overnight, when there’s an excess supply of electricity. If you have time-of-use metering you will save money using this option; even if you don’t save money, you’ll be reducing overall energy use and possibly greenhouse gas emissions, because a larger share of the electricity generated overnight is from non-CO2 emitting sources. Don’t mix dirt grades! Don’t mix slightly dirty dishes, such as pre-rinsed plates, glasses, and cutlery, with filthy dishes such as greasy pots and pans. Instead, pre-rinse the really greasy stuff (using gray water, of course). Otherwise things like glasses wind up getting dirtier before they get cleaner. Keep big pots and pans out. Don’t wash very large dishes such as frying pans or soup pots in the dishwasher, unless the dishwasher is already almost full and you’re just adding one or two. A pot or pan that takes a quarter of the bottom rack can probably be washed by hand with a couple of drops of soap and a pint of water if you are careful. That same space can hold 8 or more plates. Don’t wash clean dishes! Don’t wash dishes if they’re not really dirty. Coffee cup saucers are often clean enough to put back into the cupboard after use. And drinking glasses used for water can usually be reused many times without washing, if you keep track of who drinks from each glass. Consider getting personalized glasses for each member of your household, so each person’s water drinking glass only needs to be washed once a day (or when it is used for drinks such as milk or juice). When people think of a dishwasher they usually think of the electricity that pumps water around inside the dishwasher. In fact, pumping and draining uses less energy than heating the water – only 20% of the total, compared to 80% for heating both in your hot water tank and in energy efficient dishwashers themselves, according to the Association of Home Appliance Manufacturers. Pumping the water at high pressure, which blasts food off your dishes more effectively than you can hand-scrub it, and allows a very small amount of water to be used. Where energy efficient dishwashers aren’t so energy efficient is where people sabotage the energy saving features of the dishwasher, by pre-rinsing, keeping their hot water tank temperature too high, using too long a cycle, using the rinse-and-hold or heated-dry features, running partial loads, and wasting detergent. It is possible to outperform a dishwasher in terms of energy efficiency. Whether it’s worth the effort is another question. Consider the fact that energy efficient dishwashers with an ENERGY STAR logo can do a full load of dishes for the energy equivalent of at most 1.54 kilowatt hours of electricity (including all the energy for mechanical and heat). At a typical cost of $0.10 per kilowatt hour, and assuming you wash the dishes in cold water, the most you would save is about 15 cents per load. And remember, we’re talking a full dishwasher load – which is supposed to hold 6-8 complete place settings as well as 6 serving pieces. Assuming bread plate, dinner plate, bowl, cup and saucer, knife, fork and spoon, that’s about 72 items washed, so you’ll save about one fifth of a cent per item if you wash by hand and use no energy. Never drain ‘gray’ water. After you’ve washed a load of dishes by hand, or rinsed vegetables, leave the water in the sink. Use this gray water to pre-rinse the dirtier dishes to remove most of the grease and other food. That way, when it comes time to wash, you’ll need a lot less water. Never let the tap run for extended periods. Turn it on for a few seconds at a time, only when you really need that extra water. Use a faucet aerator. You can rinse dishes with much less water with a faucet aerator, which injects air bubbles into the water. Use cold or just lukewarm water. I’ve lived in Costa Rica for six months already, and no one here washes dishes in hot water. Of course, the cold water comes out at about 70F, not 40F, since we’re in the tropics, but you can wash with cold or just lukewarm water in colder climates. Start with an inch of warm water in the sink. Wash dishes in that, and rinse in your second sink with cold water, if you have a second sink. Otherwise stack the dishes on the counter after washing, and then rinse them all in cold water when you’re done the soap wash.
Just like your mom taught you, start by washing the cleanest dishes – glasses, cups, cutlery, plates, and finally pots and pans. Using these techniques I can wash all the dishes from a meal for four people in about three liters of fresh water. If you would like proof that energy efficient dishwashers can outperform hand washing, here’s convincing evidence that energy efficient dishwashers not only clean dishes using less energy, water and detergent than human subjects, but also get the dishes cleaner. A University of Bonn study asked 113 subjects to wash 12 dinner place settings of dirty dishes. Each subject was left alone in a room and observed by camera; energy, water and detergent use were measured. The dishes were then assessed for cleanliness following an international cleanliness standard. The same test was repeated using energy efficient dishwashers. The energy efficient dishwashers used 15 liters of water and 1-2 kwh of energy to wash 12 dinner place settings, while only two of the 113 subjects used under 20 liters of hot water. (40 of the hand-washers used over 100 liters of water each!). However, 70 of the subjects did manage to use no than 2 kwh of energy – including 27 who used 1 kwh or less. The way I read the results of this study, it is possible to match the energy performance of energy efficient dishwashers, or even beat their performance slightly. But the amount of energy saved is so small that it doesn’t justify the extra effort. All test subjects took at least 40 minutes to do the load, while the energy efficient dishwashers required only 15 minutes of human work for loading, starting, and unloading. Considering that the US EPA/DOE rates dishwasher efficiency assuming 215 loads per year, a typical handwasher would be adding 25 x 215 minutes, or 89 hours, of work to their year. That’s over two weeks of 9 to 5 work hours out of your life! You’re probably better off to save that time and look at other things in your house you can do to save energy. Imagine how efficient your house would be if you devoted an extra 89 hours to caulking, weatherstripping, changing light bulbs to more energy efficient bulbs, and so on. Anyone with more than one person in their household should consider looking at new, energy efficient dishwashers if they don’t already own a dishwasher. It’s very likely you’ll save energy, if you opt for an ENERGY STAR rated model. People who already have a dishwasher should consider upgrading to a recent ENERGY STAR model if their dishwasher is more than 10 years old, or more than 5 years old if the dishwasher was not ENERGY STAR rated at the time of purchase. Efficiency standards for all dishwashers were increased in mid 1994, raising the average efficiency by 20% over the previous standard. This means that all dishwashers sold in North America today are energy efficient dishwashers, compared to almost anything sold 15 years ago or more. Dishwasher efficiency is a combined energy use rating, including the energy that heats the water in your water tank as well as all electricity used by the dishwasher itself. ENERGY STAR dishwashers, as of January 1 2007, are required to use at least 41% less total energy than the upgraded minimum efficiency standard for dishwashers. So a new ENERGY STAR rated dishwasher is at least 60% more energy efficient than the least efficient dishwashers sold in 1994. Some energy efficient dishwashers, such as the Equator PLS600 dishwasher, get ratings as high as 181% better than the minimum standard, and can do a load of dishes for as little as 0.78 kwh of energy (or about 8 cents if you assume all the energy used is electricity sold at $0.10/kwh). Standard dishwashers are 24 inches wide (60 cm) while compact dishwashers are 18 inches wide (45 cm). A standard dishwasher is supposed to hold 8 or more place settings as well as six ‘serving pieces’ according to the US EPA / DOE standard, although 12-14 place settings is sometimes cited as the typical size of a standard model. A standard dishwasher will save you more energy if you always run full loads, but if you have a small household – 1-3 people – you may save energy by using a compact dishwasher, which is designed for 6-8 place settings (or under 8 place settings, plus six serving pieces according to the EPA/DOE standard), because you might otherwise be tempted to run the full-sized dishwasher more often than necessary, e.g. when you are running low on a particular dish or cutlery item. Most Web articles on energy efficient dishwashers recommend a standard dishwasher for more than two people, except where limited space only allows a compact model. Of course, if you are determined to do the dishes by hand most of the time, and just want a dishwasher for the occasional dinner party, a compact dishwasher might make more sense. Soil sensor technology allows a dishwasher with this feature to sense how much food waste is in the water stream. The food waste is filtered out by fine mesh filters, and is drained as the wash proceeds; once the food waste falls below a certain threshold, the wash cycle stops. This reduces the total run time for each load, saving mechanical energy. Energy efficient dishwashers that have this feature help you save energy by deciding for you what cycle length to use, taking the guesswork out for you. Water sensor technology is used by some energy efficient dishwashers to determine how much water is needed. More water is added only if required, so light or relatively clean loads use less hot water. Heating elements on most modern models preheat the water to 140F, so that you can set your hot water heater to a more energy efficient 120F. Since the dishwasher is probably the only home appliance that requires water at this higher temperature, it’s more efficient to heat it in the dishwasher, rather than keep a hot water tank at the higher temperature and allow all that heat to escape through tank and pipe walls over time. Rinse and hold is usually not recommended for energy savings, but there are situations where it may make sense. You may be better off running a brief rinse after loading dishes from a large meal, to rinse food off and prevent caking, and then run the dishwasher later when it is full, rather than running a half-full dishwasher right after the big event. Still avoid using rinse and hold as much as possible. Units that come with many wash cycle options may allow you to customize to maximize energy savings. But bear in mind that most people pay attention to these features when they buy, and then just use one or two settings when they use the dishwasher, so a unit with 10 wash cycles may actually be better than one with 20. It’s more likely you’ll choose the most efficient cycle for your needs from a small set of choices; a bigger set just means you’ll be overwhelmed and are more likely to choose the same setting each time. Delayed start is a great feature for cutting electricity costs if you have time-of-use electricity billing. It also saves energy if you can set your dishwasher to run in the middle of the night – although this is energy at the power plant, not energy at your meter, so it won’t affect your energy bill. Make sure your dishwasher is a quiet model if you’ll be running it overnight, unless you don’t mind the drone of the dishwasher while you’re trying to sleep. The worst time to run a dishwasher, from an environmental standpoint, is during the hottest part of a summer day, or generally during the workday when demand by commerce and industry tends to push the electricity supply more towards dirtier energy sources such as coal and nuclear. You should definitely start your search for new energy efficient dishwashers by looking only at ENERGY STAR qualified models. As mentioned earlier, these models are at least 41% more energy efficient than the minimum required by law in the US. But don’t just buy any ENERGY STAR dishwasher. Look for the most efficient dishwashers that have the features and size (compact or standard) that you need. Energy prices always rise more than you expect them to, even when you take into account the golden rule. Before you go shopping, you should understand how energy efficient dishwashers are rated. Ratings are based on an ‘Energy factor’, which is a measurement of how many standard dishwasher loads can be washed using a total of one kilowatt hour of energy. The minimum energy factor for a standard dishwasher is 0.46, which means you should, with any standard dishwasher sold in the US today, be able to wash 0.46 loads of dishes with one kilowatt hour of combined energy (electricity for the mechanical components and dishwasher heating element, electricity and/or natural gas for the hot water). The minimum ENERGY STAR energy factor for dishwashers is 0.65, while the maximum available is 1.29, far higher than the minimum required by law. Remember, for the energy factor, bigger is better. You can look at the inverse of the ENERGY STAR factor (1/factor) to determine kilowatt hours per load. Multiply that by the number of loads you expect to do per year, and then by 0.10 (assuming 10 cents per kwh is a reasonable approximation of your electricity use) and you'[ll know how much money you’re likely to spend on energy for each model. Looking at the above list, it seems that any of the DCS dishwasher, Fisher & Paykel dishwasher, Kenmore 1332 dishwasher, and KitchenAid KUDD03ST dishwasher would be good buys from an energy savings standpoint. Just remember that buying an ENERGY STAR dishwasher is not the end of your quest for energy efficient dish washing; it’s only the beginning. Energy efficient dishwashers can waste a great deal of energy if used improperly. Don’t use the Steri-Clean feature (heats water to 160F instead of 140F) unless sanitation is a real requirement. Don’t use heated dry, rinse and hold, or a heavier cycle than you need. If you buy the most efficient dishwasher you can find, and you use it effectively using the tips I’ve provided above, you’ll get years of good use from it with very low energy costs.